A master at combining historical and religious intrigue with edge-of-your-seat adventure, New York Times bestselling author James Rollins brings back Sigma Force to battle a group of rogue scientists who’ve unleashed a bioengineering project that could bring about the extinction of humankind. In Washington D.C., a homeless man dies in Commander Gray Pierce’s arms, shot by an assassin’s bullet. But the death leaves behind a greater mystery: a bloody coin found clutched in the dead man’s hand, an ancient relic that traces back to the Greek Oracle of Delphi. As ruthless hunters search for the stolen artifact, Gray Pierce discovers the coin is the key to unlocking a plot that dates back to the Cold War, one that threatens the very foundation of humanity. For an international think-tank of scientists known as the JASONS has discovered a way to bioengineer autistic children who show savant talents – mathematical geniuses, statistical masterminds, brilliant conceptual artists – into something far greater and far more frightening, all in hopes of creating a world prophet for the new millennium, one to be manipulated to create a new era of global peace…a peace on their own terms. While halfway around the world, a man wakes up in a hospital bed with no memory of who he is, only that he’s a prisoner in a subterranean research facility. With the help of three unusual children, he makes his escape across a mountainous and radioactive countryside, pursued by savage hunters bred in the same laboratory. But his goal is not escape, nor even survival. In order to thwart a plot to wipe out a quarter of the world’s population, he must sacrifice all, even the children who rescued him. "Once again, the action is nonstop." "Rollins has outdone himself with this fabulous mix of history, science, and adventure that will easily increase his growing number of fans." "The perfect escape novel, an edge of-your-seat read." "Lots of absorbing scientific information and tantalizing sentences." "Go out and buy James Rollins’s latest saga. He just keeps getting better and better." "Heroes: Painter Crowe, Gray Pierce and Monk Kokkalis, members of the elite covert military group Sigma Force. •Setting: Ukraine; Washington, D.C.; India •Story: An ancient coin found in the hand of a man shot and killed in front of the Smithsonian Castle kicks off a high-octane, globe-trotting hunt for the mystery behind an autistic savant who may be part of a plot to change world history. •Sizzle factor: Radioactive. Foot chases through mountains near Chernobyl, discovery of a mysterious skull in the Museum of Natural History, gun battles, car chases and the uncovering of a secret temple in India are just part of the action. 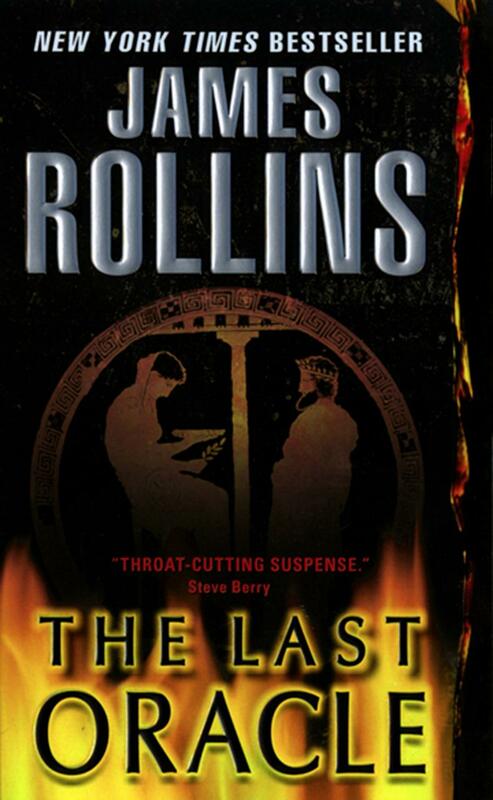 No wonder Rollins was chosen to write the novelization of summer hit movie Indiana Jones and the Kingdom of the Crystal Skull." Q. In perhaps the most terrifying plotline within The Last Oracle, you reference the decaying radioactive tomb of Chernobyl, the new Sarcophagus being created to encase the wreckage, and lethally toxic lakes of nuclear waste scattered throughout Russia,some of which lie on top of geographic fault lines. You talk of the possibility of one earthquake tearing the land apart, unleashing a toxic tidal flow, which would flood the Arctic Circle and poison the world. It's all true, isn't it? As frightening as that all sounds, it's all true. The toxic legacy of the Cold War is still with us today and it's aticking time bomb. There is a lake in the Ural Mountains of Russia that is so radioactive that if you stand at the shore for an hour, you’ll be dead a week later. That’s just the tip of the iceberg when it comes to the concepts and details that are incorporated throughout The Last Oracle. Q. In The Last Oracle, scientists around the globe are working to engineer the next Buddha, Jesus or Mohammed. Can a great prophet, a person whose touch and thought changes the world, be created by man? I believe we are not far off from this possibility (if we're not already there). The new frontier of neurology is the exploration of the brain with more and more sophisticated electrodes, some so small that they can be inserted into individual neurons. Already neurologists have inserted silicon chips into the brains of quadriplegic patients that allow them to manipulate computers to move a cursor, to surf the Internet by their thoughts alone. So how long will it be until we learn to harness the brain's full potential and scarier, how long until we learn to control that in another person? Q. In your author's notes, you write that the JASONS, a global think tank of scientists, truly exist. How were you able to delve into the shuttered world of this secret organization? The JASONS formed during the Cold War to offer advice and counsel to the Department of Justice. They were initially a band that consisted of physicists, but today, their membership has expanded to almost every scientific discipline and into most branches of the military. Few JASONS would ever speak of their affiliation, and most of their projects to this day are shrouded behind the cloak of Top Secret. But slowly information has been leaking out. One journalist did an in-depth study and interviewed many members of the JASONS and wrote a book titled,The JASONS, the Secret History of Science's Postwar Elite. Q. Tell us more about what sparked your fascination with autism and the manipulation of savant talents? Rain Man-like talent still baffles scientists and has challenged our conception of human mental abilities. What set me on the course to write this book is a quote by Temple Grandin: "If by some magic, autism had been eradicated from the face of the earth, then men would still be socializing in front of a wood fire at the entrance to a cave." It is her contention (one advocated by many historians and anthropologists) that pivotal advancements in human history have come about because of those rare individuals born with savant talents, whose unique way of looking at life have altered the course of mankind. So it made me wonder, what if someone gained control of that power? Q. This novel traces the Romani, known as Gypsies from Delphi, into the Indian Continent and across the world. Do the members of this nomadic tribe truly hold the key to long-buried secrets? Considering the origin of the Romani people has only recently been determined by linguistics, I wager there are many secrets buried among a tribe of people who have been wandering across vast stretches of the world for so many centuries. A full descriptive history of these nomadic people has yet to be done. How many stories must be buried in the memories of those who have traveled continents and centuries? That knowledge alone is a vast treasure waiting to be tapped. Q. You seem to be the Indiana Jones of the genre. What amazing adventures did you undertake in researching/mapping the plot of The Last Oracle? I finally succumbed and accepted an invitation to go diving with sharks. Suffice it to say, I still have all my arms and legs. I've also done some traveling in Russia, including into some zones marked with radiation signs. And so far, I'm not glowing in the dark. At least not yet. Q. You very gently tread into an area that borders on the taboo: scientific experimentation with children. Human experimentation has often been cloaked in the "greater good," where the "ends justify the means." All nations, including the United States, have participated in human experimentation, including involuntary experimentation. Are experiments going on today with children? In some corners of the world, I don't doubt that they are. Especially with disenfranchised children - the poor, the mentally ill, the disabled. Do other nations perhaps turn a blind eye to such experiments? I don't doubt that, too, especially in today's climate where the mantra seems to be growing that the ends justify ANY means. Q. Your books tend to feature man-eating squid, toothy grendels, flesh-eating swarms of frogs, and more. What killer creature (or exceptional animal) did you mastermind for The Last Oracle? In this book, a group of children are on the run from a menagerie of genetically enhanced beasts, but they have a companion at their side: Marta, an elderly chimpanzee who has a few secrets of her own. Fill out the form below to create a review for the-last-oracle-a-sigma-force-novel. Your review will have to be approved first before it will show up on the site.